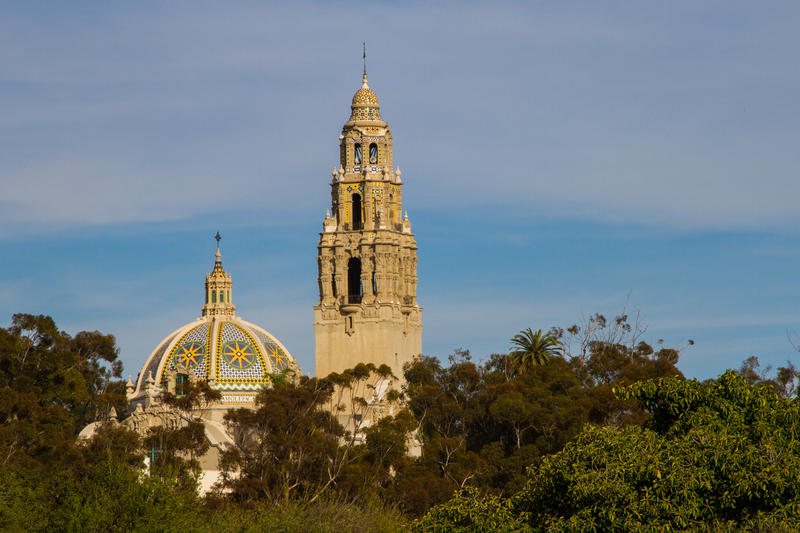 Balboa Park’s California Building, aka The Museum of Man, is one of the most famous of all San Diego landmarks. If you sit on the starboard side of an airplane landing at Lindberg Field you will see it dominating the landscape in the park. The bell tower is 200 feet high and covered in ceramic tile. It is fashioned after the tower of the Cathedral of Morelia, Mexico. The buildings are nearly 100 years old now, built for the Panama-California exposition held in 1915 on the occasion of the opening of the Panama Canal. The bell tower houses a 100-bell carillon that plays every 15 minutes. 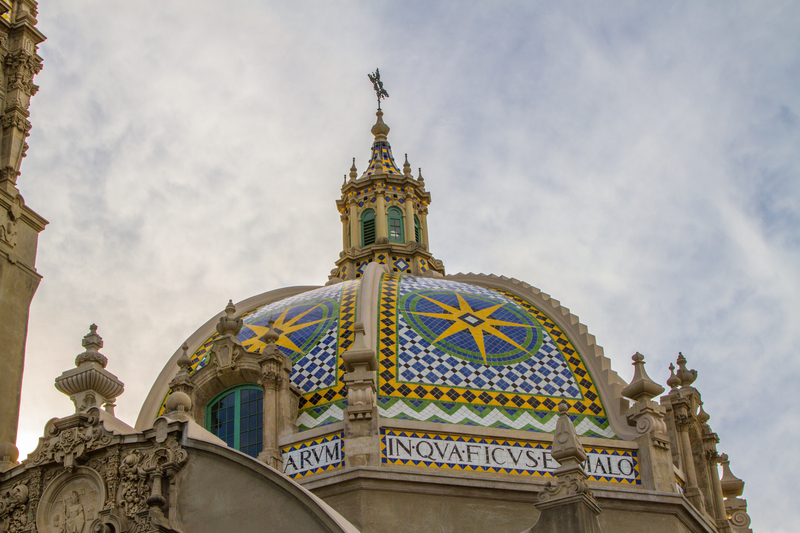 The central dome of the Museum of Man is inlaid with ceramic tile and the starburst is inspired after the Church of Santa Prisca and San Sebastian in Taxco, Mexico. Kongo spent the afternoon hiking around Balboa Park to get photos of the Museum from various vantage points. 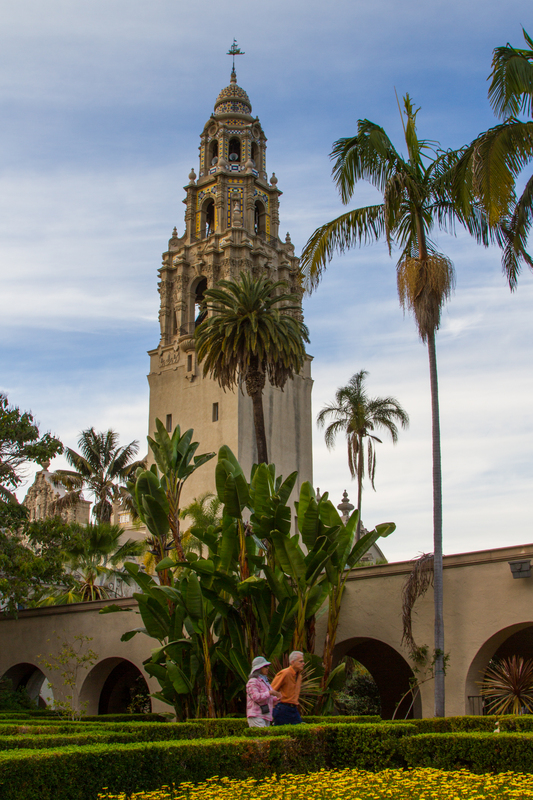 The first picture is taken from the Alacazar Gardens which is across from the bell tower and continually refreshed with new plantings. The photo of the dome above was taken from Copley Plaza in front of the Old Globe Theater. 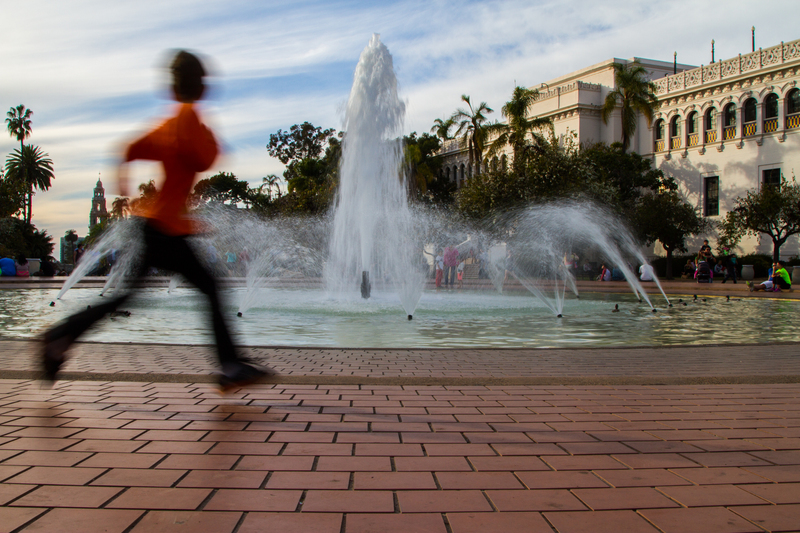 These two images show the bell tower in the background from the Be a Evenson Fountain. 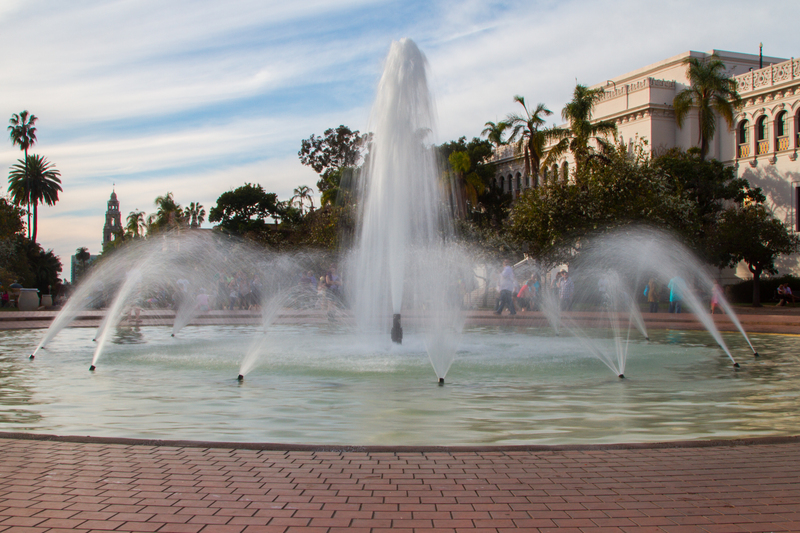 The fountain has a 200-foot wide wading pool that is a popular spot on hot summer days for children (and the young at heart) and ducks. Children just can’t seem to resist racing about the fountain over and over, like the young man caught speeding through Kongo’s shot above. This final image shows the bell tower and the dome from the far side of the dog park near 6th avenue. The buildings of the Museum of Man are so big that it’s difficult to get a shot of the entire thing up close, even with a wide-angle lens. The bell tower and facade glow gold in the late afternoon sun. The museum studies anthropology and has a number of permanent exhibitions as well as some interesting special exhibits. Now, for example, you can see Instruments of Torture and Beerology. Quite a spread of interests and something for just about everybody. Learn more about the museum at its website. The museum is open every day at 10 except for Thanksgiving and Christmas. Adult admission is $12.50. Thanks for this interesting insight. Something to explore if we ever get to USA. Thanks, Gwendoline, I do hope you get to visit soon!